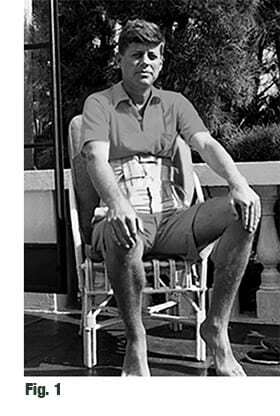 Dr. Janet Travell’s recently released medical records reveal that President John F. Kennedy suffered chronic back pain and spine degeneration (Fig. 1) leading to the development of a thoracolumbar scoliosis.1 Apparently, Kennedy’s osteoporotic problems and subsequent spinal breakdown, resulted from massive doses of corticosteroids prescribed is the 1930’s for digestive disorders. In the general population, the most common reason for this type of adult scoliosis and deformity is degenerative spine disease. Pain, difficulty sitting or standing, stiffness, and spinal rigidity are often associated with various types of pathologic scoliosis. 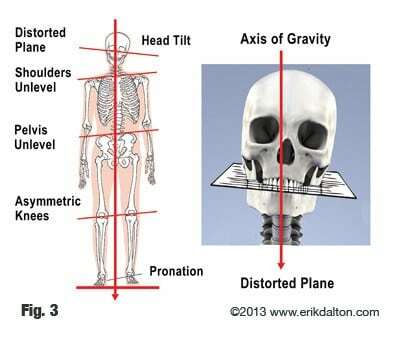 No matter the cause, the greater the degree of deformity, the more gravity drags on the unbalanced limbs causing eccentric force distribution and compensatory bracing throughout the myoskeletal system. Some manual therapists avoid treating a rigid structural scoliosis, but I’ve found the progression can often be halted or helped using various manual therapy techniques. When a person with structural scoliosis performs the Adam’s Test (forward bending while standing), the thoracic and/or lumbar convexity (hump) will get worse. With the client in this torso-flexed position, ask them to sidebend and rotate their trunk to each side and pay close attention to the vertebrae above and below the fixed curve. 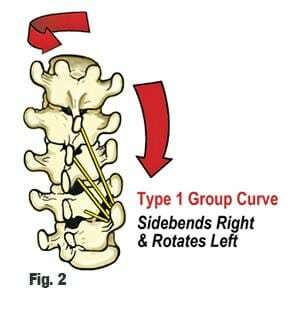 You’ll typically see some twisted spinal segments try and straighten. Osteopaths call these areas where the spine is crooked, but mobile, “Type 1” group curves or, more generally, a functional scoliosis. I’ve found there is a functional component to almost every structural scoliosis. Sadly, these mobile segments may eventually become fixed into the primary scoliotic curve via facet tropism (deformity and spurring), if left untreated. To test for available motion in the suspected segments, try gently springing the ribs above and below the primary scoliosis while the client’s trunk is flexed, sidebent and rotated. If a soft palm or fingers can produce movement, these areas must be labeled and treated as a functional (fixable) scoliosis. Technically, a functional scoliosis must consist of three or more adjoining vertebrae that rotate to one side and sidebend to the opposite side (Fig. 2). A functional scoliosis is essentially a postural adaptation to an imbalance in one’s base of support. Most of us think of the feet as our only base of support, but what about the sacral base and occipitoatlantal joints? When unlevel, the head and spine must make necessary adjustments. These primary bases of support may trigger ascending or descending postural adaptions patterns throughout the kinetic chain (Fig. 3). Improved technology and the ability to assess muscle function have changed the picture in regards to the benefits of exercise for scoliosis. We now know there is asymmetry in muscle function for everyone with scoliosis. More specifically, there is uneven strength in trunk rotation. 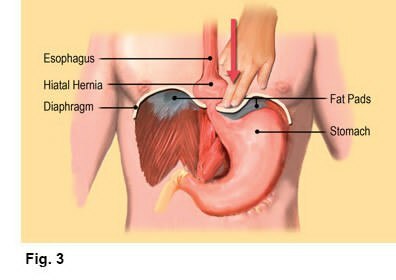 This asymmetry affects one’s posture, appearance, pain tolerance, and in more severe cases, the ability of one’s lungs to function to their full capacity. Proprioceptive exercises such as wobble boards and balance-ball training improves body positional awareness, and is particularly beneficial for scoliotic clients. Pilates, Yoga and Tai Chi also challenge spinal stability/mobility, and are great motor learning exercises that stimulate nervous system functioning. Myoskeletal Alignment combined with proprioceptive exercise may help improve ingrained motor control problems and sensory motor amnesia in those with functional or structural scoliosis. Beyond this, specific corrective exercises such as those shown in my upcoming “Art of MAT” video series with special guest Paul Kelly (Temple Human Performance), may also be beneficial in establishing proper length/strength balance and spinal stability.